Aleca Zamm, an ordinary ten-year-old with an extraordinary talent, spends a day in the 1950s with Aunt Zephyr and Ford in this hilarious fourth novel in the Aleca Zamm chapter book series. 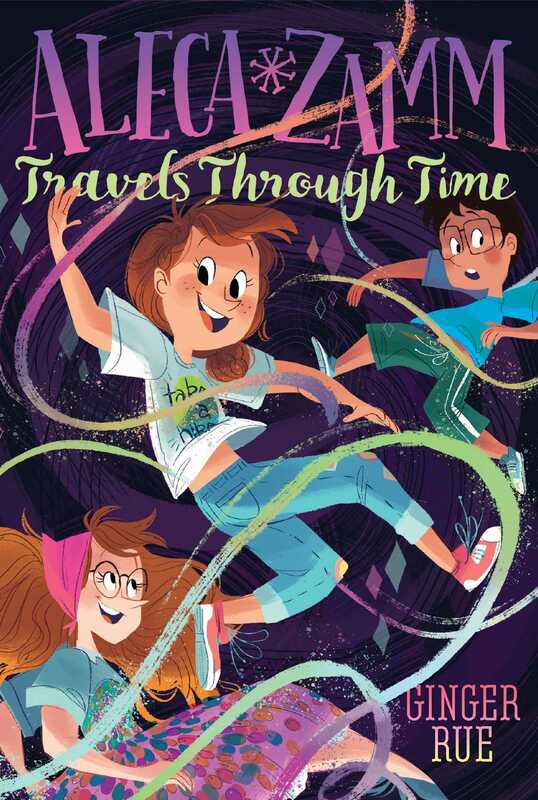 For Aleca Zamm, being friends with Ford, a fellow Wonder, means even more magical adventures! Ford can see things from the past and future, and when he sees a bridge that no longer exists in the present, Aleca can’t wait to investigate. Hand in hand with Aunt Zephyr, the three of them manage to cross the bridge and climb through a portal into the past. Aleca, Ford, and Aunt Zephyr spend a day in the 1950s. At first, it’s exciting to see how things have changed, but time travel doesn’t come without snags! And when it’s time to go back home, they return to the bridge and find that the portal is gone! Will they be able to find a way home? Or are they stuck in the past for good? I could hardly sleep. Ever since I’d turned ten, my life had been more exciting than coming home to find a dozen monkeys wearing overalls in your bedroom (which has never happened to me but would be awesome if it did, and hey, you never know). I had found out I could stop time just by saying my name, Aleca Zamm. That meant I was a Wonder, a person with a magical ability. I was like my great-aunt Zephyr and her brothers, who had also become Wonders when they’d turned ten. Before I’d known that I was a Wonder, I hadn’t thought there was anything special about me at all. But now here I was, feeling very special, what with my ability to stop time, my teleporting great-aunt, and my new friend, Ford, who could see stuff from the past and the future. Like, he could see this bridge we were going to try to cross. That was not something just everybody got to do! When I had gotten home from school that day, I’d found Aunt Zephyr a complete mess, watching a soap opera on TV and feeling all loser-y about herself because she thought she couldn’t Wonder anymore. But I had gotten her out of her funk by telling her that Ford had actually walked on the bridge only he could see, and she had promised me that we—meaning Aunt Zephyr and me—could try to figure out a way to see Ford’s bridge and maybe even walk on it too. I couldn’t think of a good reason to wait until the next day to try this, but Aunt Zephyr could think of three reasons. First, it was getting dark outside by the time she finally agreed to my plan, and she figured that if we were going to try to make seven-year-old Ford walk all the way across a bridge, we ought to wait until it was at least daytime so that it would be somewhat less scary for him. I should also mention that the bridge we were going to cross didn’t exist anymore. Also Ford was the only person who could actually see the bridge. Second, Aunt Zephyr needed to rest because her teleporting had been way? jacked up and she’d had a hectic day of landing in places where she hadn’t intended to go. Third, none of us could drive to school. You’d think that a lady as old as my great-aunt would have a driver’s license, but why drive when you can just think yourself somewhere? She’d never bothered to learn how to drive a car, so we needed to wait for Mom to take me to school the next day, since the bridge we were crossing was just a few steps away from school. But that meant we also had to come up with an excuse for why Aunt Zephyr would be going with me. We had decided that we’d tell Mom that Aunt Zephyr was going to be giving a talk to my class about geography, because she had been everywhere in the world at least twice. Mom did agree. She just didn’t know that we weren’t telling her the whole story. Because the whole story was that Aunt Zephyr would, technically, be lecturing the class about world geography, but nobody would hear it because time would be stopped and they’d all be frozen. But she would still give a short lecture, even if no one heard. I did wish Aunt Zephyr had toned down her outfit, because I didn’t think it was a good idea to draw attention to ourselves on a day when we were going to cross a secret bridge, but Aunt Zephyr rarely toned down anything. Not her outfits, hairdos, or even the things she said. She was wearing a dress that had multicolored sequins the size of pennies all over it. And as if the sequins weren’t enough, the dress also had a lace collar and hem and big buttons down the front. She was also wearing a scarf in her hair and big hoop earrings and high-heeled shoes with fringe that looked like fireworks exploding. “Why is everyone staring at us?” she asked as we walked into the building. “Because you are wearing every color of the rainbow and you are shiny,” I replied. “You sure nailed ‘special,’?” I said. And I guess she had a point. Because we were going to try to do something probably nobody else had ever done before. I mean, how many people do you know who have actually walked on a bridge from the past that no one else can see? Of course Ford had been too scared to walk all the way across it by himself. I couldn’t see the bridge at all, and when I’d tried to walk on it with him, I’d fallen. Not far, but enough to know that there wasn’t a bridge there for me. But Ford had kept on walking, and to me it had looked like he was walking on air. I couldn’t stand it. I had to walk on that bridge too and see where it went. So Ford and I had cooked up this plan with Aunt Zephyr to see if we could figure out how to make it so I could see the bridge too. But we had to get all three of us together at once to try. Here we go again, I thought. I was going to have to make up a story to tell Maria. I couldn’t tell her the truth, because Wonder-ing was super top secret. We had to keep it secret because Aunt Zephyr said that Duds (regular people) might be scared of Wonders or bad Duds might try to hurt us in some way. So we couldn’t tell anyone—especially not people who had a hard time keeping a secret, like Maria. Maria was the best friend I’d ever had, and I so wanted to tell her that I had magical powers, but Aunt Zephyr had forbidden it. I had to keep making up reasons for the strange things that had been happening around me, like why the principal’s pants had fallen down or why two mean girls had had their hair suddenly glued together or why a bug had appeared inside a bully’s mouth. Luckily for me, Maria didn’t really have sneakiness radar. Otherwise she would have been onto me fast. “I have some rain boots in my cubby if you want to borrow them,” Maria offered. I was just glad that the discussion of shoes had distracted Maria from her original question, about what Aunt Zephyr was doing at school. “But—” I began. Before I could finish my thought, which was that Aunt Zephyr’s teleporting hadn’t been very reliable lately, she was gone. On the upside, her teleporting had worked immediately. On the downside, there was no guarantee that she’d teleported home. Ginger Rue is the author of the middle grade Tig Ripley and Aleca Zamm novels, as well as Brand-New Emily and Jump. She lives in Alabama.